For latest information on floods, lake levels and rainfall in Mumbai, please view this article => Latest Mumbai Lake Levels, Rainfall Levels and Flood Risk Dates. July, 2014 has been the wettest in Mumbai since 1951. Mumbai lake levels and Actual Vs Normal rainfall are listed below. Mumbai Lake Level: Latest Water Level in Mumbai’s Lakes, in 2014. Water in Mumbai’s 7 Lakes as on 18 September, 2014. There is 11 months of usable water in Mumbai’s lakes. Usable water in lakes and dams that supply water to Mumbai is 1,397,448 million litres. At the same time in 2013, Mumbai’s lakes had approximately 1,259,577 million litres. Lakes and Dams supplying water to Mumbai have a total storage capacity of 14,47,000 million liters. The Monsoon in Mumbai started poorly, but has recovered well in July and August; especially the last week of July. The good news is that just 3 day of good rainfall has seen a dramatic increase in water levels in Mumbai’s lakes. Heavy rain from 28 July to 31 July, 2014 increased water in Mumbai’s lakes by 429,725 million litres (this is 123 days of water supply). Until 28 July, water level in Mumbai’s Lakes was 373,000 million liters; on 31 July, 2014, it was 803,000 million litres; this is an increase of 115% in just 3 days. Tulsi Lake was the first lake to overflow on 27 July, 2014. Modak Sagar Lake overflowed on 30 July, 2014. Tansa Lake overflowed on 4 August, 2014. Middle Vaitarna Dam and Lake overflowed on 20 August, 2014. Vihar Lake overflowed on 1 September, 2014. For Mumbai the most important lake is Bhatsa Lake which has filled up to 88% of its full capacity. On one good day of rain – 30 July – water in Lake Bhatsa increased by 15% of it’s full capacity. From 13 August, BMC has withdrawn water cut to Mumbai’s residential customers. 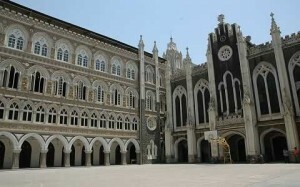 The BMC, which manages water supply to Mumbai, had initially cut water supply by 20% to residential consumers; but after heavy rains in end July, the BMC has reduced the water cut to 10%. Commercial establishments face water cuts from 50% to 100%. Mumbai has received the most amount of rain in July, since 1951 and also the least amount of rain in June, since 1951. Just 3 days of very heavy rainfall (29, 30, 31 July) has drastically increased the water in Mumbai’s seven lakes by 115%. Mumbai requires 4,200 million liters of water every day. BMC only supplies between 3,500 million and 3,750 million liters of water daily to Mumbai; which is approximately 80% of Mumbai’s water requirement. The balance water is supplied by tankers, wells, rain water harvesting and water tubes. Mumbai has around 18,000 wells. BMC supplies 135 litres daily per person to housing societies, 135 litres daily per bed to hotels, 45 litres per person in slums and 70 litres per table in restaurants. As per BMC’s estimate the 135 litres supplied to each residential user is used for “Drinking” (10 litres), “Cooking” (10 liters), “Toilet (Flush)” (40 litres), “Laundry” (35 liters), “Personal hygiene” (30 litres) and “Others” (10 liters). Over 85% of water is used for non-cooking/drinking (potable) purposes. 1,454,700 million litres is the total usable water capacity of Mumbai’s 7 lakes and dams. Bhatsa Lake and Dam is the most important of Mumbai’s lakes. It supplies 40% of Mumbai’s BMC lake water. Middle Vaitarna Dam and Lake is the second most important water body for Mumbai. Middle Vaitarna has the capacity to hold 1,90,000 million litres of water. After missing deadlines, it was finally commissioned in 2013. Built at a cost of Rs 2,000 crore, Middle Vaitarna Dam is located at Shahpur in Thane district. Middle Vaitarna lake overflowed for the first time on 20 August, 2014. In its search for water, BMC is planning the Pinjal Dam project, which is expected to be completed by 2022. Pinjal Dam will be connected to the Damanganga project. A 65 Km tunnel will connect Pinjal Dam to the Bhandup water treatment plant. The Rs 15,000 core Pinjal Dam is expected to supply 1,000 million litres of water daily to Mumbai. BMC has also received permission to start technical studies for the Gargai Dam Project. Gargai is in Ogade, which is 120 Kms from Mumbai. Asia’s largest complex water treatment plant is at Bhandup in East Mumbai. The Bhandup water treatment plant has a daily capacity to treat 2,100 million liters of water. Of the 7 lakes, only Vihar Lake and Tulsi Lake are within Mumbai. Navi Mumbai residents get water from Dehrang Dam in Panvel. Pune gets water from Khadakwasla Dam and Panshet Dam. Mumbai Rainfall Level: Actual Vs Normal (Average) Rain in Mumbai. 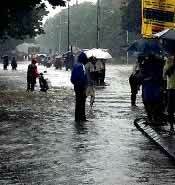 This year Mumbai has received the maximum rainfall in the month of July, since 1951. Mumbai-Santacruz received 1,454 mm of rains in July, 2014. The second highest July rainfall was in 1965 with 1,455.5 mm of rain, followed by 1961 with 1,385.5 mm of rain and 1988 with 1,226.1 mm. Ironically in June, 2014, Mumbai received the least amount of rainfall since 1951. Mumbai-Santacruz received only 87.3 mm of rain. In July, 2014 the rainfall level in Colaba (Mumbai) has changed from a deficit of 87% to a surplus of 9% and in Santacruz from a deficit of 83% to a surplus of 14%. Mumbai lake catchment areas too have been receiving heavy rainfall in the last week of July. In August 2014, Mumbai City (Colaba) received 432.4 mm of rainfall and Mumbai Suburbs (Santacruz) received 458.0 mm of rainfall. This was below the August average of 508.7 mm. Due to “El Nino”, rains during the 2014 Monsoon season in Mumbai (and India) was expected to be below normal. In 2014, there are 23 days during Mumbai’s Monsoon season when high tide level will be over the danger mark of 4.5 meters. The maximum High Tide level of 5.0 meters will be on 14 July, 2014. Listed below are Mumbai Monsoon 2014 dates when the High Tide Levels in the Arabian Sea will be more than 4.5 metre. From a flooding perspective, these are the most dangerous or risky days during the 2014 Mumbai Rainy season. 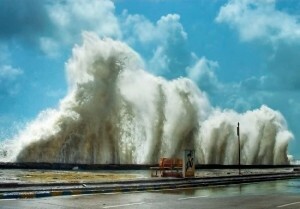 Excessive rain water in Mumbai is drained into the sea. When the Arabian Sea levels go over 4.50 metres, the BMC has to take a decision whether to close the storm drains to prevent sea water from entering into the city of Mumbai. If the Mumbai storm drains are closed on days when there is HEAVY RAIN and HIGH TIDE LEVELS are very high, then there is no outlet for rain water. This can cause floods in Mumbai. Mumbai residents are advised to be cautious on the High Tide dates and time listed below. El Niño occurs when the surface temperature of the Pacific Ocean, mainly the Equatorial Pacific Ocean, increases by over 0.5°Celsius. When El-Nino occurs, India, South Asia, South-East Asia, Australia and EasteramAfrica receive below average rffall. On the other hand, Western South America and North America receives above average rains. The seven lakes that provide water to Mumbai may not fill up to capacity in case Mumbai’s rainfall is below average. This may lead to water cuts in the future. Typically El Nino starts between June and August, reaches its peak between December and April and fades away between May and July. Visit this link for further information on what is El Nino and its affect on India and its Economy. 108 is the BMC’s Disaster Management Cell’s contact number. During the Mumbai Monsoon Season, “Brihanmumbai Municipal Corporation” (BMC) operates a special Disaster Management Cell. Also at the BMC ward level there are special telephone numbers set up for the Mumbai rainy season. The Disaster Management Cell handles rain related emergencies, such as open drains, broken trees, flooding, damaged roads, etc. In case of excessive flooding and rains, BMC issues caution and closure notice to the general public and education institutions, such as schools and colleges. DILAPIDATED BUILDING IN MUMBAI: In 2014, BMC has identified 1,236 dilapidated buildings in Mumbai, against 959 in 2013. Of these the maximum number of dilapidated buildings (129) are in “B” ward (D’Mello road, Bhendi Bazar, Abdul Rehman Street), followed by “P-North” ward (Malad) (116), “K-West” ward (Andheri West, Oshiwara) (94), “E” Ward (Byculla, Raey Road) (90) and “L” ward (Kurla) (89). Most of Mumbai’s dilapidated buildings are in Mumbai city (539), followed by Western suburbs (459) and the Eastern suburb (238). LAND SLIDE ACCIDENT PRONE SITES IN MUMBAI: In 2014, BMC has identified 266 sites that are at risk from landslide. “S” ward (Bhandup) has 148 such spots. LOW LYING FLOOD RISK PLACES IN MUMBAI: In 2014, BMC has identified 222 water logging sites. 2013 too had the same figure. Parel to Sion, Kurla, Malad, Goregaon and Borivali have the maximum number of sites at risk from water-logging and flood. 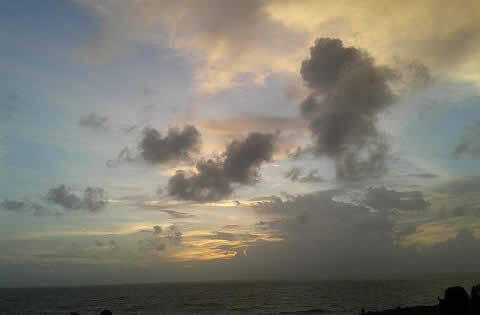 “Monsoon clouds arriving in Mumbai” Image by Karthikndr. Image is taken from Wikimedia Commons. Image is licensed under the Creative Commons Attribution-Share Alike 3.0 Unported license. Image has been altered.